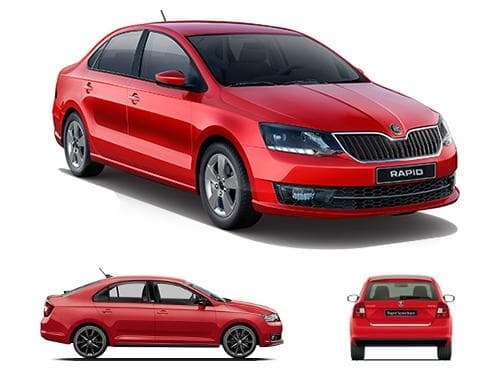 Skoda Rapid is a mid range sedan from the Czech automobile giant that has a fuel tank capacity of 55 litres. It is available in petrol variant only. With a respectable 15Kmpl of mileage it allows the rider to take this car for a long drive without worrying about the fuel. However, when the fuel gets below the critical level the car warns the driver thus allowing him or her the time to look out for the nearest filling station to fill the petrol tank of this sedan. The company has also provided this chic looking vehicle with a remote fuel lid opening option. Among the competitors of this sedan in the Indian market only Volkswagen Vento has similar size of 55 litres of fuel tank. Others like Hyundai 4S Fluidic Verna, Maruti Suzuki Ciaz and Ford Fiesta come with only 43 litres of fuel tank capacity. The Honda City on the other hand has the smallest fuel tank of 40 litres in this segment of cars. Compare fuel tank capacity of Skoda Rapid with its immediate competitors. Fuel tank capacity of Skoda Rapid competes directly with Hyundai 4S Fluidic Verna, Fiat Linea, Ford Fiesta, and Volkswagen Vento. Together put, any fuel tank capacity above 45 Litres is more than decent, however, if the fuel tank capacity if less than 40, you need to hold and think. In case you often drive long distances, a 40 litres and beyond fuel tank capacity will be good for you. On the other hand, if commuting between home to office is what you intend to do with your car, you may consider even 30 Litres to be sufficient as well.